The Cessna Model 120 prototype, first flown on 28 June 1945, was a two-seat cabin monoplane with a strut-braced high-set wing. The structure was all-metal, except for fabric-covered wings, the landing gear was of fixed tailwheel type introducing cantilever spring steel main units, and the enclosed cabin provided two seats side-by-side and dual controls as standard. Powerplant a 80 hp / 63kW Continental engine, and the higher power of this unit by comparison with competing types, plus a low price tag, ensured that Cessna gained an unexpectedly large measure of sales success. New for Cessna were the all-metal fuselage and spring steel undercarriage designed by Steve Wittman of EAA fame. The wing was fabric covered and featured rounded wingtips. The Model 120, a basic aircraft, was complemented by a 'de luxe' Model 140 which provided as standard manually actuated trailing-edge flaps, extra cabin windows behind the doors and a full electrical system. Cessna’s 140 was a deluxe version of the 120 model when both debuted in 1946. With a few cabin refinements, the 140 had a starter, generator, battery, and manually operated plain-hinge flaps. Both were powered by the Continental C85-12 of 85-hp, but the 140 could accept the 90-hp Continental. 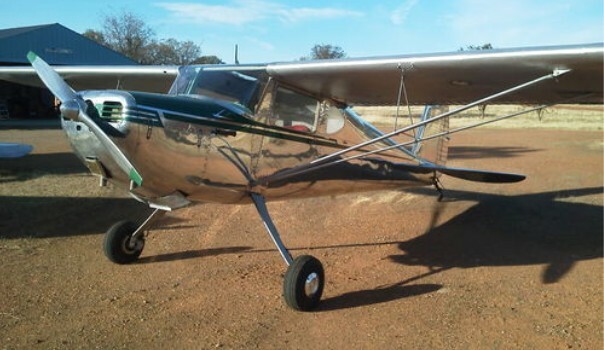 A total of 2,164 120s were produced by Cessna before this model was phased out in 1948. The side-by-side two-seat 140 continued in production with a choice of the 85-hp or 90-hp engine. Introduced in 1949 as the 140A, the 90-hp version had a metal skin in place of fabric covering on the wings. It featured single wing struts in place of the earlier “Y” struts. More than 5,500 140s and 140As were built before the series was permanently discontinued in 1950. Overall length: 21 ft. 6 in.